The 2018 Peppadew® Young Chefs Culinary Challenge recently took place. Just six young chefs made it to the national finals on the 5th of April. Our very own Pastry Chef, Chef Shaista Anoop, and Advanced Diploma student, Mbuso Tembe, were two of the young chefs who took part. To be considered as finalists for the competition, the young chefs had to submit recipes and photographs to Peppadew®. Mbuso Tembe and Chef Shaista had to prepare a menu consisting of a starter, main, and dessert. Chef Schools around the country were invited to participate. Young chefs aged 18-25 from all over South Africa took part, including several of Mbuso’s classmates. A unique part of the submission process required young chefs to submit their “Five-year plan” along with their entry. This forward-looking insight into the hopes and dreams of young chefs in South Africa is encouraging indeed. 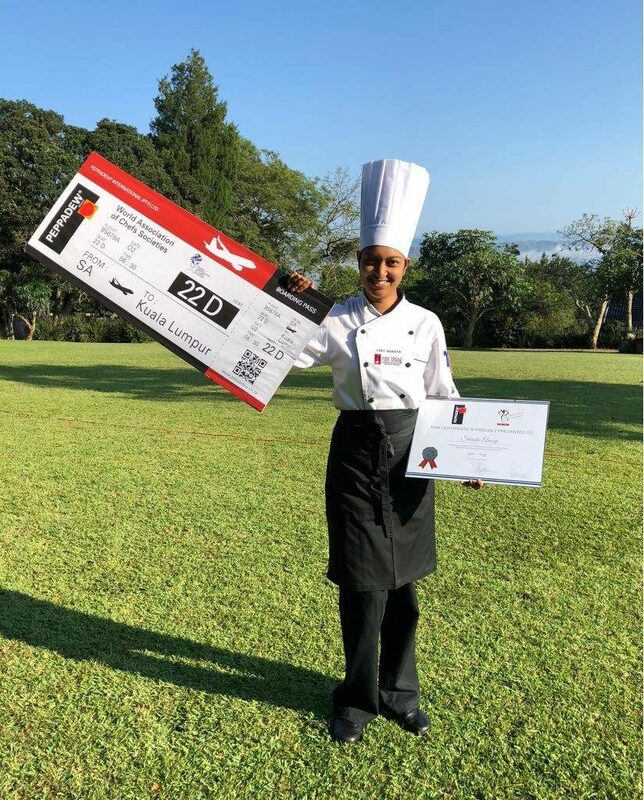 We are thrilled to announce that Pastry Lecturer Chef Shaista from 1000 Hills Chef School took the title with her winning three-course meal. She will be jetting off to Malaysia to attend the Worldchefs Congress in Kuala Lumpur in July 2018. Chef Shaista is no stranger to competitions, having made it to national finals in the Unilever Young Chef of the Year competition in 2017 and scoring second place in the Huletts Sweet Young Chef competition in 2015. She says this Peppadew® Challenge cook-off was just that – a real trial of skill. She loved the objective of incorporating the sweet but spicy Peppadew® products into her dishes. As a pastry chef, the dessert was her particular test in using this traditionally savoury ingredient, and she was happy with her dishes. “Every competition offers a great learning experience and expands your scope of skills. It gives the chance to work with experts that you might not meet every day, like Chef Martin and the judges, one of whom is on the SA culinary Olympic team, and that means new people to learn from”. Chef Shaista is “soooo excited” to be visiting Malaysia. She cannot wait to try their food and explore their cooking styles, as well as interact with young chefs from all over the world. A big plus for her is bringing back all that knowledge, insight and experience to share with her students. Do you dream of becoming a top chef? Enrol for the class of 2019 at 1000 Hills Chef School. We also hold a number of open days throughout the year. Book your spot at our next Open Day here and come take a tour of our beautiful campus.